Parkway Forest is a master-planned community by a single developer, ELAD Canada. 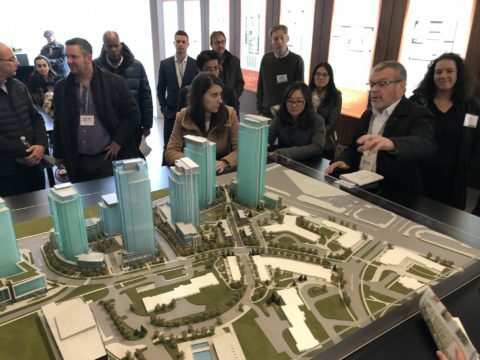 Development began 10 years and the site mainly consists of high-rise and mid-rise buildings in North York. 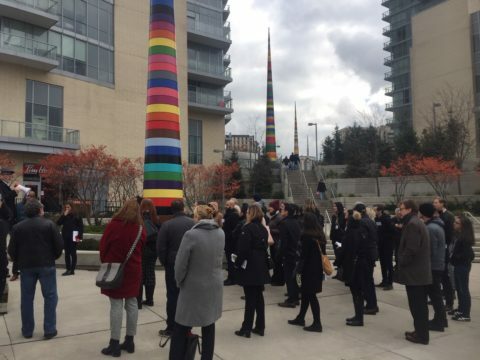 Participants on this tour included Len Abelman, Principal, WZMH Architects; Leo DeSorcy, Manager, Urban Design, City of Toronto; and Netanel Ben-Or, EVP, Elad Canada. The tour started with a walk through from the community centre to the north end of the site. WZMH Architects highlighted that the goal was to create a local community with character and identity. The tour showcased the green park space and playground located between each building. Townhouses along the concrete path were built with front porches and patios at the back to provide a sense of community and security as residents walkalong the paths to the subway. The greater open space was achieved by replacing surface parking lots with underground parking. The architects spoke about the mixed brick colour and different exterior finishes, which were designed to add language to the development. A community centre was constructed at the heart of the development and a new road was designed to connect all the buildings. The advantages of a single-developer master-plan development is control and speed. It is easier to adjust building design and density for a changing market. Tour participants were impressed with the results. The tour started at North Toronto Collegiate Institute on Broadway Avenue. 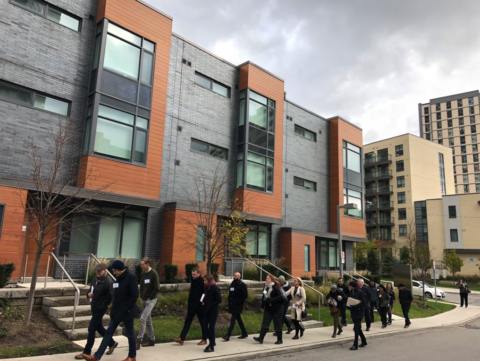 Participants on this tour included Paul Kulig, Principal, Perkins & Will; Kristy Shortall, VP, Metropia; Alex Teixeira, Senior Planner, City of Toronto; and Cassidy Ritz, Project Manager, Strategic Initiatives. Teixeira spoke about the intensification challenges in a non-master planned neighbourhood with competing interests and multiple developers. Ritz stated that there were applications for approximately 10,000 units 10 years ago compare to 20,000 units currently in development proposals. The City did not anticipate the degree of development. The City has limited options for creating green space in this intensifying neighbourhood. Land is expensive, there is a very limited amount of new open green space and the City does not have the funds to acquire land for a park. Finally, development charges such as new park contributions often benefit other neighbourhoods given the current lack of space. Consequently, Teixeira highlighted several initiatives to maintain a sense of community as well as visual and land use contrast. The City encourages a mixture of high-, mid- and low-rise buildings beside each other to add contrast. Secondly, the City also enforces a 7.5 metre setback from the street to give a sense of community. Thirdly, developers are encouraged to improve the quality of the front lawns of each building with upgraded lighting and shrubbery. In contrast to master-planned developments, development times are extended since negotiations are required with multiple interests. The overall message and group reaction was positive. The City is doing its best with limited resources to create a sense of community. CityPlace is a master-planned development by a single builder, Concord Adex. 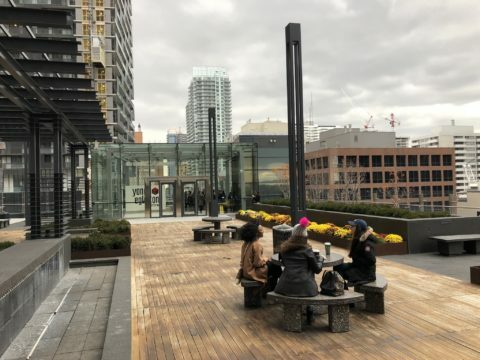 However, the site is located in a space-constrained area of downtown Toronto. Participants included Peter Duckworth, Principal, ZAS Architects; James Parakj, Manager, Urban Design, City of Toronto; Annely Zonenna, Senior Planner, City of Toronto; Gabriel Leung, VP Development, Concord Adex; Jeanhy Shim, President, Housing Lab; and Emily Reisman, Partner, Urban Strategies. The tour began with the community centre currently under construction at Fort York Boulevard and Canoe Landing Park. Given the somewhat limited green space, the centre will have rooftop park. The community centre will be a low-rise building to break up the multiple high-rises. Leung of Concord Adex stated that adding ground floor retail space to each condo building is important to add to the community and improve walkability. City of Toronto staff noted that what they would do differently is construct the community centre while the development was in progress instead of near the end of the masterplan development to better serve the residents. An interior tour of a Concord condo development showcased how the developer is adjusting its buildings to meet the needs of young families and creating purpose-built childrens’ playrooms and arts spaces. The takeaway was the City and developer are listening to current and prospective owners in providing amenities. Providing these resources earlier in the development cycle adds to the community and interest in the development.